as i stated in my project proposal blog, my final project was a storytelling series wherein i used the written, visual, and audio mediums to tell a particular story about my character mo. bellow i have linked the three different projects and corresponding blog posts i have done. each of the projects i have attached above, contain a 3-4 paragraph analysis of the project, the tools i used to create it, and how the projects relate to one another. thus, i will not go over that part of the project assessment here. instead, i’d like to asses my experience working on the project as a whole. i initially decided to center my project in fredericksburg virginia, the campus community i currently reside in, because i wanted to blur the line between the world in which my character exists in and the one i encompass. while my character, mo, has supernatural empath abilities and is not bound by time or space, the oppressive and repressive systems she seeks to distress are as real as this laptop i am currently writing in. in terms of the editing process of this project, i must say, i underestimated how time much time it would take me to work through it. storyboarding— taking the photos — editing — critically-conscious blog posts — all in all took about 12 hours. nevertheless im glad i was challenged creatively and technically. this is the last piece in my final project series. it is a soundscape, an audio piece made to be heard in a particular location. in my case, this is meant to be heard while reading the poem and watching the gifs component of this series. i thought to conclude my series with a soundscape as a sort of reference to a line in the poem that reads “tried with all of her senses to imagine,” because that is what story exploration is, trying to share an idea of a world with someone through all these different modes of communication. given that there is a lot of abstract and referential ideas being presented in the gifs and the poem, i sough to make this sound piece quite direct. it starts out with the sound of leaves crunching and footsteps. the begins, and the background noise ceases when the lines “mo sat/ mo inhaled-exhaled” are read, and this was intended to illicit a sense of calm and deep thought. this line also coincide with the gif “alley,” wherein a figure intended to be mo, is sitting cross legged in the middle of the street. lastly, the piece ends with some soothing jazz and laughter, because one of mo’s purposes is to bring calm and joy during times of pain and trauma. this is the visual component of my project, which is inspired by the poem i wrote to set the scene. making these gifs was a very time consuming process because i did everything in the gifs from scractch: i took the photos, drew the writings and the figures, and created effects on every frame that made up the gifs. my thought process in capturing and selecting each images was to get different angles of that particular scene. for instance, the first gif, “auction block,” presents the different angles to the slave auction block in downtown fredericksburg. after selecting the frames, i decided that i needed to add text or images to the gifs so that the audience can have some context, seeing as how everyone may not be privy to the places or their relevance to the story i am creating. additionally, i wanted to create a story from one gif to the next. in the “auction block,” the last frame reads enslaved people were sold here in faded white brush strokes, and in “fred,” in white store-sign font is history is a cycle, both referencing the historical presence of anti-blackness in fredericksburg virginia and its modern recurrence. 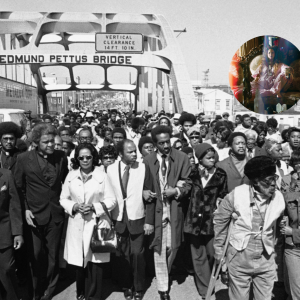 next, the gif “alley” presents a human figure and the writing peace love & justice demonstration @4pm @dupont, hinting to a new location for the story, which is presented in the gif “dupont,” wherein a demonstration and speeches seem to be taking place. these gifs are meant to visualize what the audience has read and listened to, in regards to this story series. what has brought her here? when will this space reckon with its history? as i mentioned in my project proposal, writing a poem was the first part of the multi-medium story i was creating. while i think this poem can stand on its own as a scene in my character, meskeen aka mo’s story or lore, there are somethings that need some background. for instance, the first line, “this place seems of a time bygone,” without context, reads to mean that the buildings look historic and regal. but familiarity with mo’s storyline lets us know that she travels time and is not bound to any particular century or continent, so this line is a reference to a past mo has lived. something i struggled with when writing this piece was, do i tell or show mo in action and in conversation with folks. the benefit of the later is that there is greater nuance about the character and the readers/observers get to make of mo and her actions. the difficulty with that, for a character like mo and the world in which she lives in, is that it is difficult to succinctly capture the essence of a scene. like, how do i set up a scene for a racial justice protest in which mo is to act as this superhero-esc, empath, and time traveler that is there to help the movement and the insure the wellbeing of the event attendees — and all in a reasonable 300 or less written format. that is why i have gone with the option of telling mo’s story through a narrative style instead of a dialogue-heavy piece. as the first in my four installment serious, this poem is to act as the introduction to a particular story i will share about mo through the written, visual, and auditory formats. my final project will be an exploration of my character meskeen aka mo, through the written, visual, and sound mediums. my written piece, a poem, will be the centerpiece and reference point of the other work created. throughout this course i have referenced to mo’s abilities, character traits, and general essence, but i have yet to actually just show her in action, so that is what i hope to due in the poem. so far i have decided the setting of the poem, and thus the rest of the pieces, will be Fredericksburg Virginia. specifically as it relates to its history with slavery, and the on going relationship of black people with the city. i have not yet decided if i will be referencing the city explicitly or just using it for inspiration. for instance, the pictures i will be taking for the project’s visuals will be taken on the UMW campus and in downtown Fred. the sounds i will be recording will be based in Fred. i feel confident with what i have planned so far for the project. i know the content i will create (poem, photo, sound) and the software i will use (photoshop, garageband), all that is left now is to make it happen. this week’s set of assignments were interesting because they required the reuse of art that has already been create — which is not something new we are doing this week — but the fact that it was our theme and aim to remix/mashup made the whole experience “legitimate,” and say not a co-op to creating our own content. in doing the mashup assignment “disney mashup,” i decided to mix the intro songs of my favorite disney channel shows, the proud family and that so raven. at the beginning of this mashup i wanted there to be intros where you see the name of the shows. then a slowed down 5-10 sec clips of each of the shows alternating. then i concluded with fast alternating clips of both the shows so that it feels that while two different narratives and formats are being utilized, its in the same world, where these quirky blk girls get to be young and free. i used youtube for the clips and iMovie for editing. the grinch did not hate Christmas, he hated people, which is understandable. all he every tried to do was mind his business, eat his cookies, and love the girl he love. but because of the hater-ation and holler-ation of his bullying classmates, he got mean. then when kindness and love was extended to him, he did good by the people and Christmas. so again, the grinch just really did not have time for rude and demeaning people, as my true movie trailer edit shows. i got the video from youtube and used iMovie to edit it. i decided to focus on the grinch’s childhood — origin story– because i feel that is what the original trailer keeps hidden so as to not spoil the story. in the mashup assignment “superhuman in everyday life,” i decided to take creative liberty and make my superhero someone who i define under the umbrella of superhuman but is not a dc/marvel character. 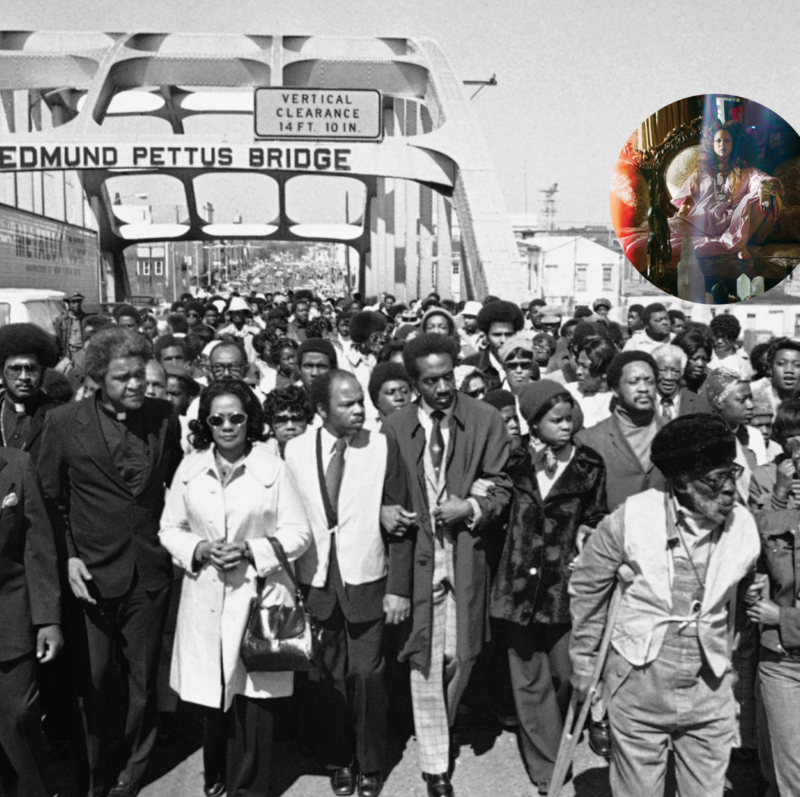 in the image above i have mashed up the Edmund Pettus Bridge Civil Rights protest in Selma Alabama and an image of the wonderful songstris Erykah Badu. my reasons for mashing these two up has to do with my character, maskeen aka mo’s power as an empath who defies time and spacial locality to be a transient character that just appears during these pinnacle point in revolutionary spaces so as to help folks heal emotionally and maintain self care and sustenance as they continue their (r)evolutionary pursuits. that being said, i choose Erykah as my superhero symbol because i think she encompasses the essence of mo, blk pride, self-care, creativity, community activism and engagement. i knew these images were what i wanted to work with so i found them on google and then used canva to edit them. as part of this weeks remix work i did the assignment “best sports play,” wherein i was to make a gif of my favorite sports play of the season. but as a remixed assignment i was to “flip the mood,” so i did the sports play that hurt my heart. all the way back in the summer, the world cup was going on and everything was swell, there were several African countries in the cup and i held on tight to hope and prayer that at least one would represent in the finals. and nijaaaaaaa, my sister country Nigeria, i hoped would come through, but the game was stolen from us in the play that can be seen in the gif above. as can clearly be seen Argentina’s number 16 makes a hand ball and to meeeeee, a clear violation because he ought to know that while in the act of jumping to make a header, you must control your arms to not touch the ball or else it is a handball. and then Nigeria went on to lose the game by one point… i am still upset at the call. upon seeing the assignment i knew what emotion and game i wanted to reference so i went on youtube and found the clip. i then took the pictures by screenshot and then used photoshop to make the gifs.